Majority of the times during a penetration test or bug-bounty engagement, you might encounter customers who limit the scope of testing to non-jailbroken devices running the latest mobile OS. How do you dynamically instrument the application in those cases? How do you trace the various functionalities in the application while trying to attack the actual application logic? 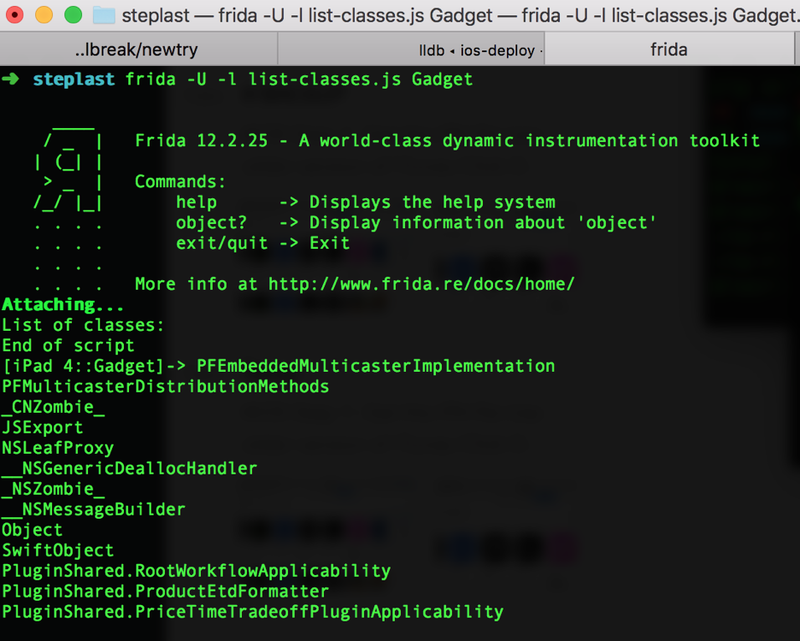 Frida (https://www.frida.re/) is a runtime instrumentation toolkit for developers, reverse-engineers, and security researchers that allows you to inject your own script into the blackbox mobile application. Normally Frida is always installed and run on Jailbroken devices. That process is pretty straight-forward. However, the complexity increases when you want to run it on non-jailbroken devices. 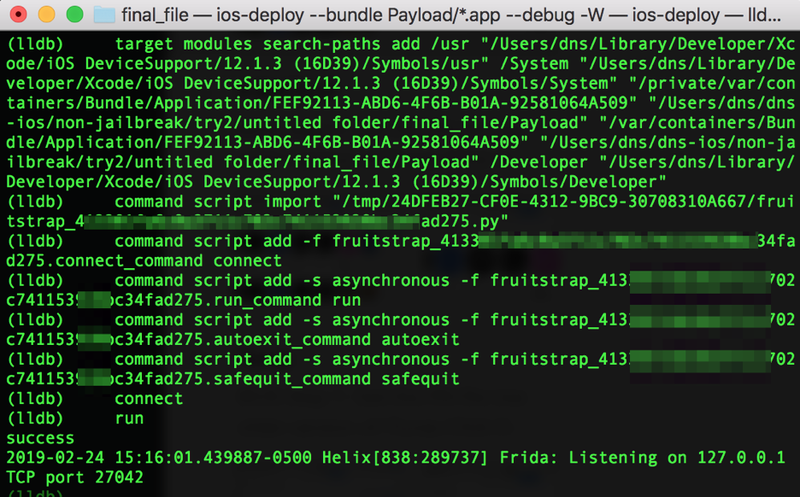 In this article I’ll explain in detail the steps to be followed to get Frida running on the latest non-jailbroken version of iOS viz iOS 12.1.4. The only requirement at this stage is an unencrypted IPA file. This is normally provided by the customer. If not, we can download the IPA file from the AppStore and then use tools like Clutch(https://github.com/KJCracks/Clutch) or bfinject(https://github.com/BishopFox/bfinject) to decrypt it. Alternatively unencrypted versions of the IPA files are also available on https://www.iphonecake.com/. Ensure that you do a checksum check and verify it with the custom before you start testing. Don’t be shocked if you find that the IPA files from the website have been modified to include un-intended code. In our case, lets target the Uber application from the AppStore. I will take you through each of these steps one-by-one. 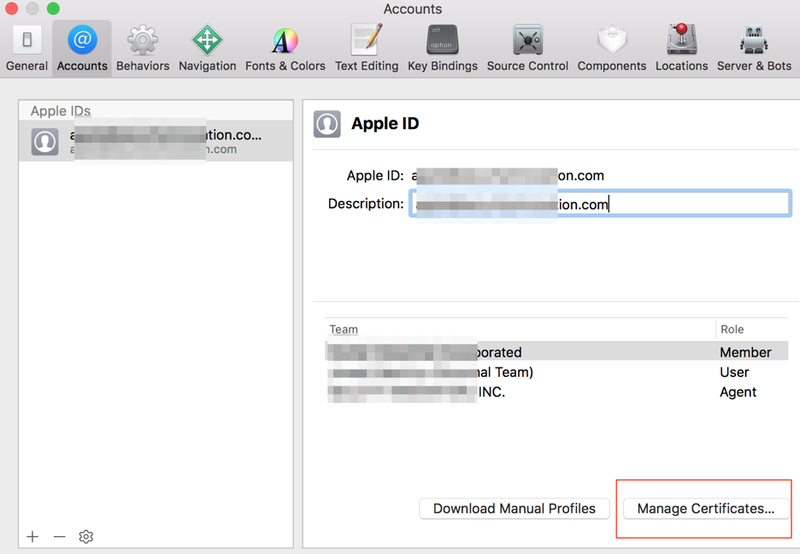 a) Launch Xcode and navigate to the Accounts section using the Preferences menu item. Make sure you are logged in to Xcode using your Apple account. b) Select “Agent” and Click Manage Certificates. c) Click + and select “iOS Development”. 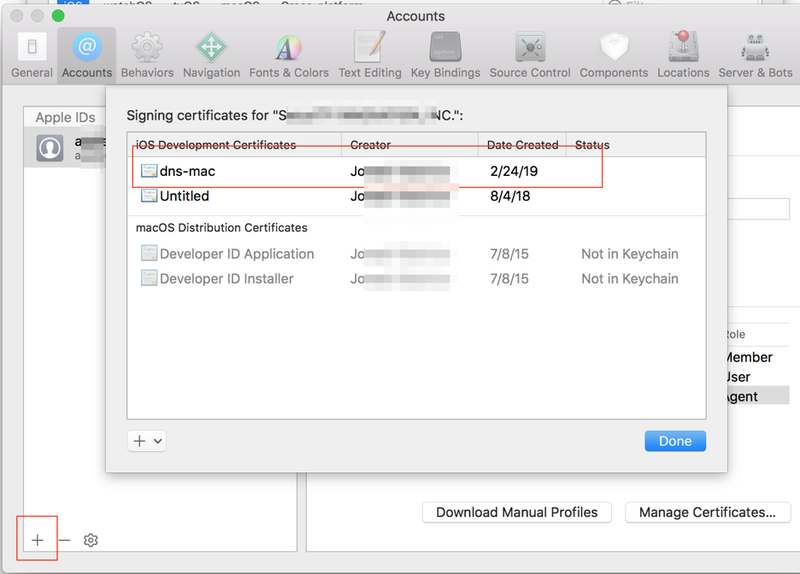 This command will output all the signing identities for your account. 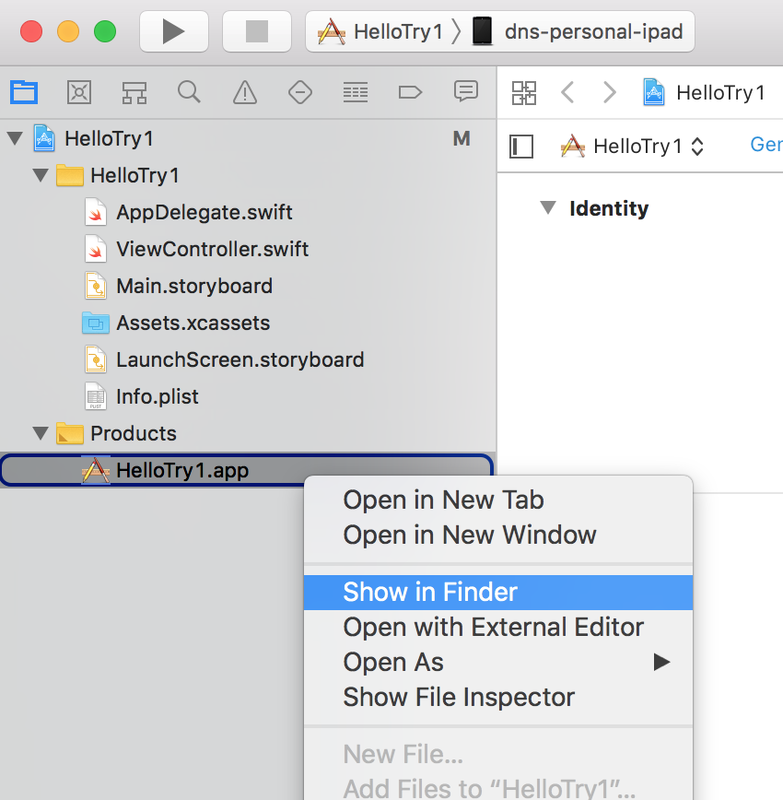 a) Next step will be to create a new Xcode project with team as agent and target as your actual test device and click play. Run the application on the device. You have to do this step for every new device that you want to use for testing. b) Right click the generated .app file and select “Show in Finder”. c) Right click the .app file from the Finder and select “Show Contents”. 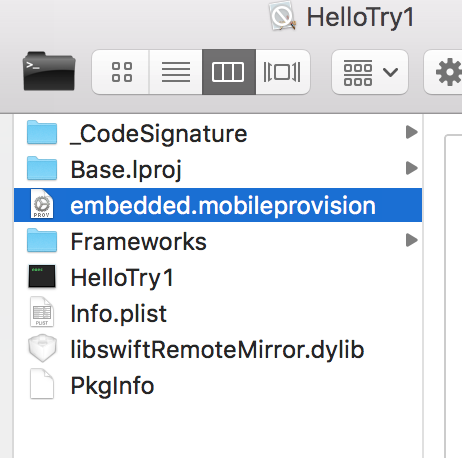 d) Save the embedded.mobileprovision file. You will need this later while signing the IPA file. b) Unzip the IPA file and copy this Frida library into the folder named “Frameworks”. If the folder “Frameworks” does not exist, create it. Use the following steps to build the insert_dylib tool. If we try to install the application now, it will fail because of code sign issues. We need to fix it before we proceed. a) Sign the Frida dylib using codesign. This can be done using the following command. d) Now, sign the patched IPA file that we created previously. 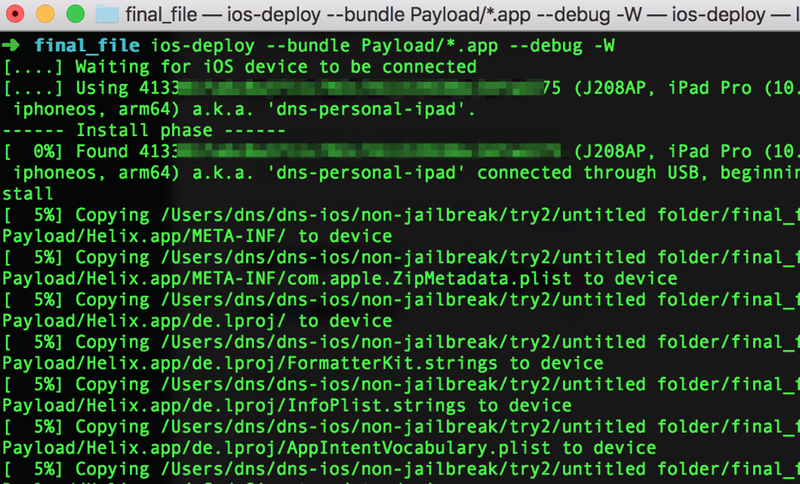 e) Install ios-deploy and then push the patched_codesign IPA file to the device. 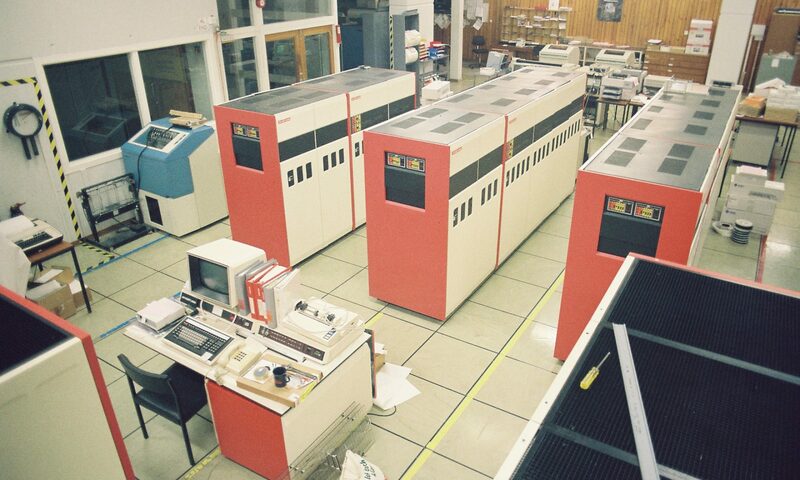 Observe that the console message indicates that Frida is now running on port 27042. That is all I have for this article. In later articles we will talk about how to use Frida to perform a variety of attacks on Mobile Applications. Looking at malware, our friends at Apple continue to maintain the 5-guys in a cave paradigm of attempting to vet all apps that enter the iOS app store. While it is a noble effort, there are still instances where malware creeps through the door. Unlike Apple, the Android marketplace is an open approach that allows anyone to contribute to the play store, and moreover represents a majority of the mobile market share. In addition, there are various third party sites that allow direct download of Android applications package files (APK’s). The Metasploit project allows a pentester to generate Android payloads with a pretty highly functional meterpreter command channel that can be loaded onto an Android device. Typically, loading this APK will be through the Android debugger “adb” through side loading. 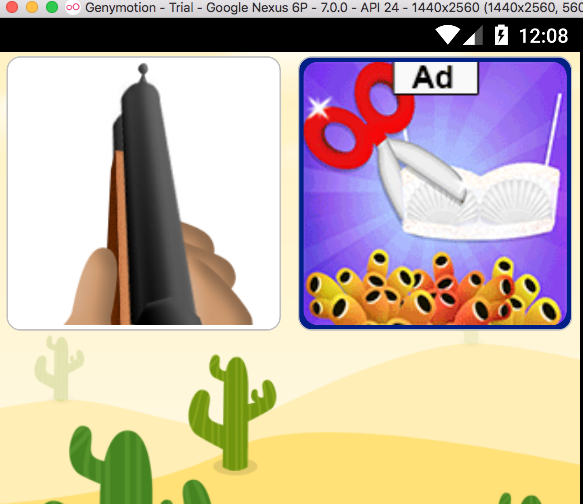 From a pen tester perspective, something that is fun to do is to combine a legitimate (perhaps fun) app with Meterpreter, and side load that app onto an Android device. Naturally, you would probably consider sending that device to a “friend” as a gift or some similar social engineering ruse. Android applications are written in Java which compiles down to a Dalvik executable format known as DEX. The compiled version of an application is a ZIP file of DEX bytecode files. The Dalvik virtual machine on Android has been more recently replaced with Android RunTime (ART) which performs additional optimization and compiles the DEX bytecode into native assembly code. The Dalvik VM primarily performs Just In Time (JIT) interpretation of the majority of bytecode. ART is higher performing than the Dalvik virtual machine which only optimized portions of the bytecode for frequently executed parts of the app. Smali/baksmali is an assembler/disassembler for Android DEX bytecode. 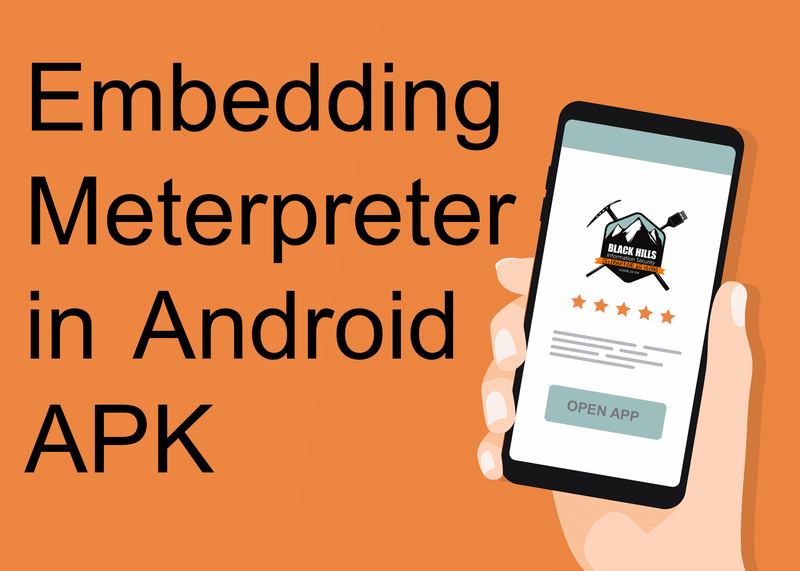 An Android tool named “apktool” enables the disassembling of zipped DEX (APK files) into smali files, and reassembling of smali files back to DEX and subsequently to the zipped APK format. We can use this tool to disassemble, and modify an existing APK file. In this context, we can use the tool to disassemble, and add a additional static entry point into the smali code of the initial Android Activity to kick off our Meterpreter. Find an existing fun APK application on “apkmonk.com” or similar mirror site. Generate the Metasploit APK file. Disassemble with “apktool” both the Metasploit APK file, and the APK file we are intending to modify. Copy all of the Meterpreter smali code over to the new APK smali directory. The activity name that encloses this intent-filter will be the entrypoint you are seeking. Modify the activity “.smali” file to include a line that starts up the Meterpreter stage. Copy all of the Meterpreter permissions from the Meterpreter AndroidManifest.xml into the modified APK’s AndroidManifest.xml. Re-assemble into DEX zipped format. Sign the newly created APK file with “jarsigner”, and then side load onto your target Android device. It is much easier to understand the above steps with a concrete example. 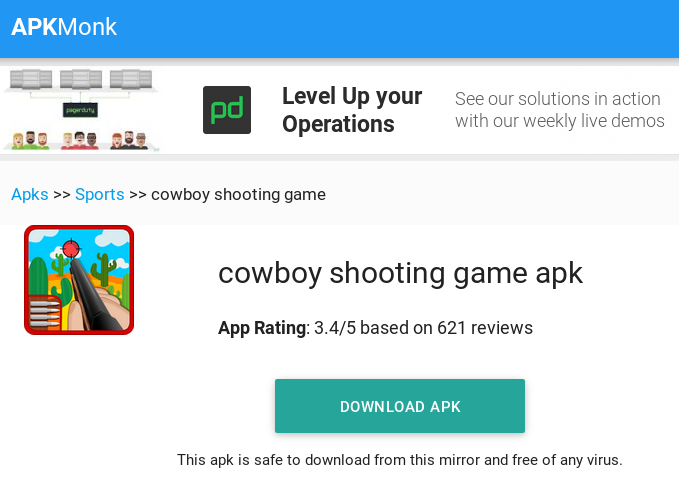 To illustrate this, I downloaded an APK file of a game called Cowboy Shooting Game from apkmonk.com. I then generated a Metasploit APK using the “msfvenom” command as follows. An easy way to do this is to change directory into the Metasploit APK directory, then copy all of the files under the “smali” directory into the “com.CowboyShootingGames_2018-09-22” directory. An old trick I learned from a systems administrator to backup entire directory trees using the “tar” command comes in handy whereby you pipe the output of tar into a second command which changes directory and “untars” the resulting files. Below we can see that the entry activity is listed as “com.CowboyShootingGames.MainActivity”. We know this because the XML contains an intent-filter with “android.intent.action.MAIN” within it. As can be seen above, in this case the file is going to be named “MainActivity.smali”, and will be located in the “com/CowboyShootingGames” directory as per the periods (“.”) in the fully qualified class path. Within the “MainActivity.smali” file, we are looking for the “onCreate()” method. We need to add a single line of “smali” code right below the “onCreate()” method call to invoke our Meterpreter stage. Please note that the above is a single line of code. It is possible to obfuscate by using a different pathname than “com/metasploit/stage/Payload” however if you do that you will have to modifiy all references to the path in all of the “smali” files that are contained in the “Payload” directory, and change the directory name itself. This can be done manually but is prone to error. Continuing without any obfuscation for a moment, the final result after modification will look like the below screenshot. For the next step, use “grep” to search for all of the lines in the Metasploit “AndroidManfest.xml” file that contain the strings “uses-permission”, and “uses-feature” into the modified APK’s AndroidManiest.xml file. You will need to use an editor to insert the permissions at the appropriate place in the new “AndroidManifest.xml” file. Search for an existing “use-permission” line as your guideline of where to insert the text. You might end up with some duplicate permissions. You can optionally remove them but it really does not matter. Now use the “apktool” again to re-assemble the resulting APK package file. The end result will be written into a “dist” directory within the APK directory itself. For resigning, one easy method is to use the Android debugging keystore which is built if you install Android studio. The debugging keystore will be contained within the “.android” hidden directory in your home directory on a UN*X system. 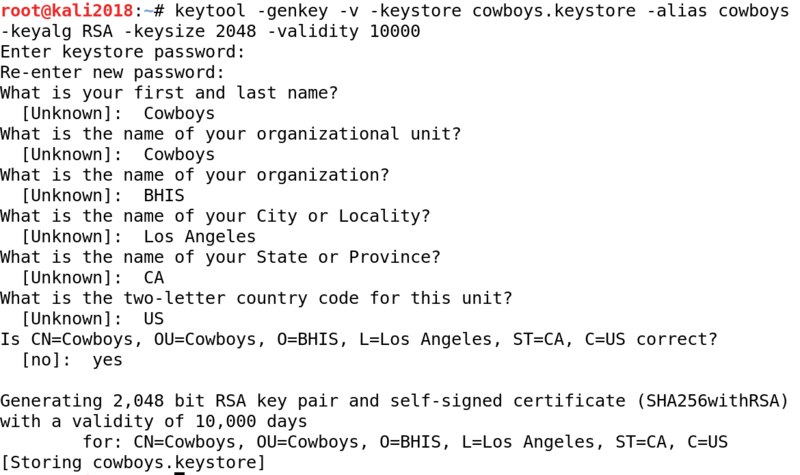 An alternative method is to use the Java “keytool” to generate your own self-signed keystore and sign it using the “jarsigner” tool as shown in the screenshots below. At this point in time, the “final.apk” file is ready to be loaded onto an Android system using “adb”. 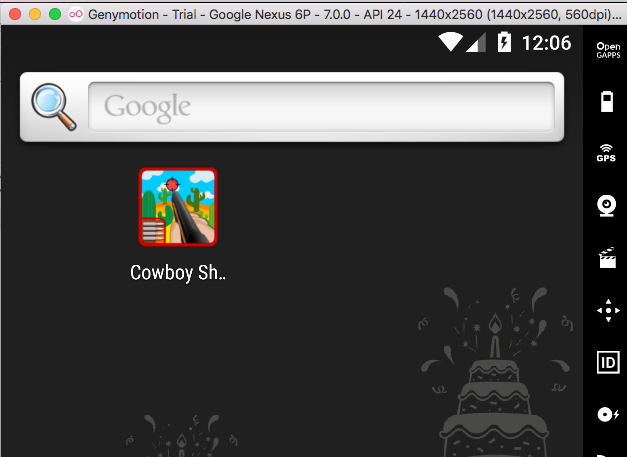 In this specific case, I am running a copy of “GenyMotion” which is an x86 based emulator that uses VirtualBox for a very high performing Android emulation. One of the challenges you might immediately run into is that the x86 emulation will not natively support the ARM processor. To get around this challenge, there are some ARM translation libraries available online. You would need to search for “Genymotion-ARM-Translation_v1.1.zip” and then drag the ZIP file onto a running GenyMotion Android system. Unfortunately, this is not 100% reliable, and some app crashes may still result. One certain way to make sure an ARM APK file runs on a device is to use a hardware device itself. I have found that the Nexus 6 series of devices are nice to work with as the “rooting” kit is fairly reliable, and attaching via a USB cable for testing is not too onerous. The final step is of course to try out our newly infected Cowboy Shooting game. We find out quickly, that the moment we launch the game, we get a Meterpreter shell on our KALI system which just feels so right. I really don’t think I am going to take the time to learn this game, which frankly was just a random pick from “apkmonk.com”. So after performing all of the requisite steps above, I was immediately frustrated. There are so many moving parts that the chances of error are pretty high. There are likely other tools out there which are available to use but I decided to whip up a quick Python script to automate this process. I called it “android_embedit.py” and I will warn you now, this is definitely a quick and dirty effort to get something to do the job without much effort on hardening the logic at all. 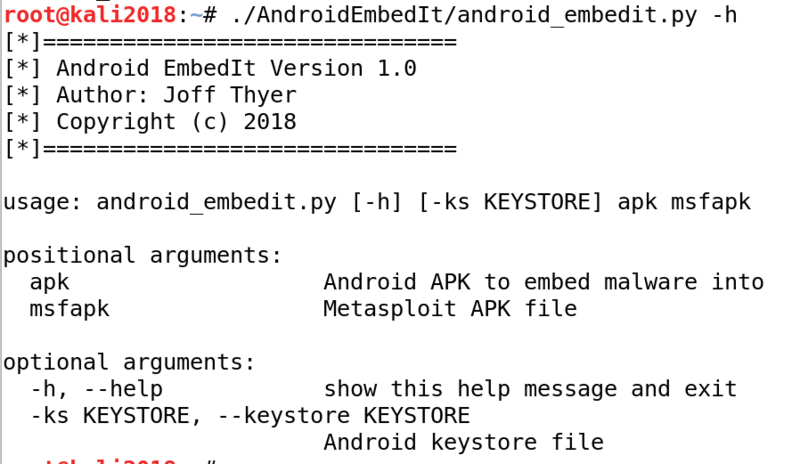 The idea of “android_embedit.py” is that if you supply a Metasploit generated APK file, an original APK to modify, and a keystore, it will perform all of the steps in an automated fashion and generate the result for you. Below is an example of running the tool. All of the temporary files, and output will be stored in the “~/.ae” directory. The tool also will remove the “metasploit” directory name and obfuscate it with a random string directory name automatically. You can see this result in the below screenshot in which I listed the contents of the APK “smali/com” directory. The directory named “dbarpubw” actually contains the Metasploit stager code. There is much continuing fun to be had with mobile apps, and their associated application programming interfaces. It is a good idea to get familiar with the platforms as a pen tester as you will undoubtedly encounter a need to test in the mobile space before long. I suppose you just might want to play with “Android EmbedIT” now! Well if you do, you can download from my github by visiting https://github.com/yoda66/AndroidEmbedIT.